low calories healthy international recipes collection. Sumptuous, tongue tickling and a creative way to add healthy foods to your diet is what this section can be described as. From dips to salsa and pasta to stir-fries and rice delicacies you will find them all here. 7 things you need to do in making low cal international recipes. 1. To choose the healthy veggies while avoiding the use of high carb ones like potatoes, yam etc. 2. Try to flavor them with herbs and spices. 3. Avoid that use of excess oil. Use olive oil as much as possible. 4. Toss in some high fiber cereals like oats, quinoa, bulgur wheat etc. 5. Avoid the processed foods completely. 6. While opting to cook rice delicacies, go in for Brown rice only and add more veggies than the rice. 7. Look upon Baking, steaming, pressure cooking or stir-frying as the best cooking methods. Nowadays kids don’t like Indian snacks anymore and they ask for more and more variations in their food and refuse to eat if the same recipes are cooked more than twice. Boost your protein and calcium levels with this Vegetable Satay, it is low in calories and fat because of the use of low fat curds and paneer. Baked Stuffed Tomatoes are made by using a sumptuous mixture of low-fat paneer and assorted veggies is baked inside juicy tomatoes, resulting in an aesthetic yet healthy 80-calorie snack. Whole Wheat Pasta in Tomato Sauce is a healthy Italian dish which is a good source of protein, calcium, B-complex vitamins and folic acid. Whole wheat pasta has been used instead of plain flour pasta, mixed with a scrumptious tomato sauce and loads of veggies that you’ll surely love. Here is a healthier version of Au gratin- a continental dish called Oats and Vegetable Au Gratin to satisfy your hunger pangs. Traditionally it is made with fat laden white sauce and cheese. The secret of making it low calories comes from using low fat milk and fibre rich oats that’s responsible for the thick saucy texture. This lovely tasting Cabbage Rolls in Tomato Gravy is sure to be loved by kids as well as adults. Low calorie cabbage is used to roll up low-fat paneer and tomato gravy is used instead of white sauce that makes this recipe very low in calories but quite satiating. Oatmeal and Spinach Crêpes with Ratatouille Stuffing are delicious and loaded with veggies that give it an amazing flavour and load this recipe with fibre. 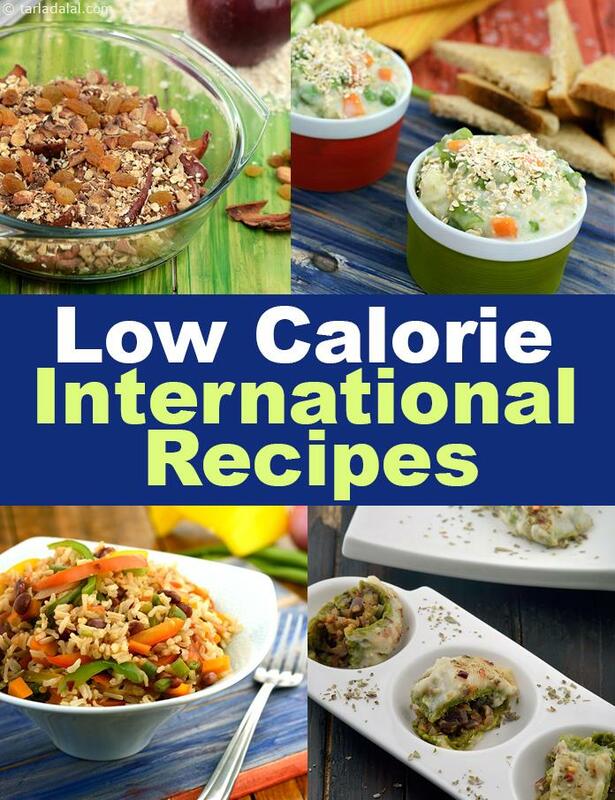 All these low calorie international recipes are sure to tantalize your taste buds without adding those extra pounds to your waist line. But just remember to enjoy them in limited portions and on occasions. A serving of two of these wraps with a glass of golden glory frappe, is good to satiate you at dinnertime and keep you going till the next morning. This meal is full of energy, fibre and flavour. A well balanced main dish with an italian flavour using low fat paneer for protein and whole wheat flour and vegetables for minerals, vitamins and fibre. This party favourite recipe is more appealing in its fat free form and i am sure you will enjoy it more. Soft pita breads made with whole wheat flour and filled with a spicy Mexican bean filling that will help to keep the blood sugar levels in check. Served with salad and a delicious mint dressing which add a bouquet of tantalising flavours to this dish.